Native to the mountains of SE China, the Chinese Yellow banana grows to about 5' high and pups very freely. It has attractive grayish-green foliage and forms nice clumps. 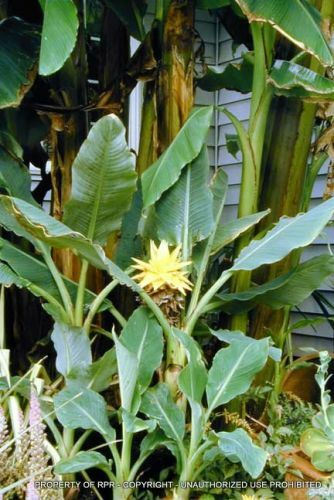 It is grown for its 6" wide waxy yellow flower that lasts for at least 6 months. Hardy to zone 7 with mulch. Our one gallon plants begin forming a clump the first year. Great also in containers.